The Daily Vote – does Joey Barton deserve a career in football? 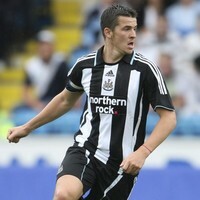 Joey Barton is free to play for Newcastle after his bail conditions were changed. Barton was charged with assault and affray last month, and ordered by a judge to live in Hampshire and return home every day by 7.30pm. However, he’s now been allowed to move to Newcastle and given a later time to report home. Barton is in Newcastle’s squad to face Arsenal tonight – but should he be? In any other walk of life, Barton would have lost his job by now. And perhaps if he wasn’t such a good player, Newcastle would have offloaded him. I believe that football, like any high-profile profession, has a moral obligation to do the right thing, if only to act as an example to society in general; what message does it send out to youngsters that a man like Barton is welcomed back with open arms by manager Kevin Keegan? To me, it says – footballers are above the law and if they’re good enough, they can get away with murder.